Taking a page out of the playbook of the Roman emperor Nero, Illinois Gov. Rod Blagojevich has done so many bad things in such a short period of time that some of his worst actions are likely to be swept under the rug. 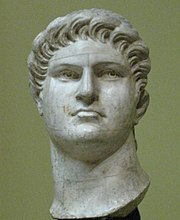 Nero, as even the dimmest schoolchild will recall, is famous for fiddling while Rome burned to the ground — a flamboyantly insensitive gesture that has obscured the fact that he also kicked his pregnant wife to death, murdered his predecessor, masqueraded as a wild beast at gladiatorial events so that he could mutilate helpless captives bound to stakes and diverted himself on evening promenades by disguising himself as a street urchin, stabbing tipsy pedestrians to death and then chucking their bodies into the sewer. It just so happens that Nero set fire to Rome not once, but several times, and did so as part of an impromptu urban-renewal project that served no purpose other than to line his own pockets. But because of the sheer impudence of setting the capital of the civilized world ablaze and then amusing himself on a musical instrument, Nero’s other crimes are less well remembered, if they are remembered at all. Plaster bust of Nero, Pushkin Museum, Moscow. The only “bust” of Blagojevich was made by police…. It would be a great tragedy if Blagojevich’s crass attempts — as described in juicy detail last week by prosecutors — to auction off President-elect Barack Obama’s Senate seat and shake down the Tribune Co. diverted the public’s attention from his other misdeeds. Politicians are always demanding some kind of payback for favors, and Blagojevich wouldn’t be the first pol to try to get journalists fired because he didn’t like the things they wrote about him. In Illinois, in New Jersey, in Louisiana, this kind of brazen scuzziness is par for the course. Society can deal with it. What’s far more worrisome is Blagojevich’s bizarre confrontation with the Bank of America. The day before he was arrested on charges of massive corruption, Blagojevich visited a group of striking workers at a North Chicago firm called Republic Windows & Doors. After being laid off the week before, the employees had begun a sit-in, demanding benefits they were still owed by their employer, which said it could not meet their demands because the Bank of America had cut off its financing. At this point, Blagojevich informed bank officials that unless they restored the shuttered window-and-door company’s line of credit, the state of Illinois would suspend all further business with Bank of America. A few days later, the bank caved in and ponied up a $1.35 million loan. The idea that the governor of a state as prosperous and important and sophisticated and upscale as Illinois would make this kind of threat is terrifying. Even more terrifying is that Bank of America saw no alternative but to give in. Yet even more terrifying is that nobody outside Chicago seems to have gotten terribly worked up about the situation, riveted as they are on the governor’s more theatrical transgressions. But peddling a Senate seat or using scare tactics to shake down a newspaper are nowhere near so serious a menace to society as letting the government arbitrarily intervene in financial transactions between banks and creditors. A crooked governor we can all handle. But a governor who capriciously decides which commercial enterprises a bank must finance and which it can ignore is a scary proposition indeed. You are currently browsing the archives for the burning category.